Fifty years ago Martin Luther King Jr. was the final speaker of a rally of civil rights protesters gathered on the Mall in Washington DC. He stood on the steps of the Lincoln Memorial and delivered his now famous “I Have a Dream” speech. Civil rights advocates five decades later gathered at the same location again to continue to press for rights for all people. The event gained international attention and Peter Roof worked with NBC NewsChannel which provided comprehensive coverage. 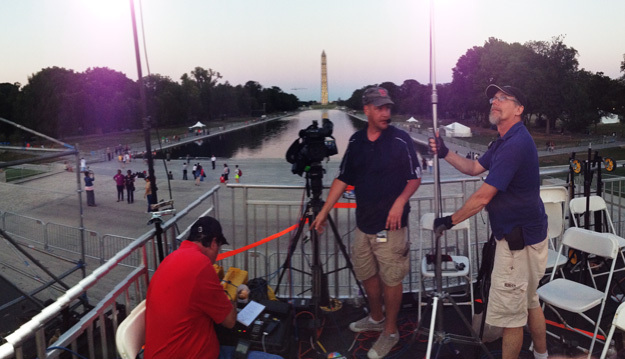 In addition to the regular customers of US network affiliates the bureau also assisted the new Al Jazeera America news channel with their live shot location on a riser built on the steps of the Lincoln Memorial. The setup involved running thousands of feet of fiber optic and telephone lines. During the march following the speeches Pete with with reporter Brian Mooar to get reactions from the participants. In all there was a lot of walking. Pete estimated he walked a total of five miles, two backwards and with a camera on his shoulder.